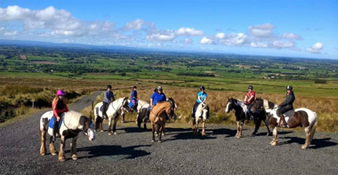 Trekking at Sheans is for First timers, Novice riders and Beginners. All treks involve getting mounted up and a short lesson before going out on an escorted walking trek on our tracks, (trotting is only done outdoors on hacks). Enjoy the beautiful scenery of the North Antrim hills where, at the top, you will enjoy panoramic views looking over 5 counties. On returning to the stables, we will teach you how to trot. (for those that want to). 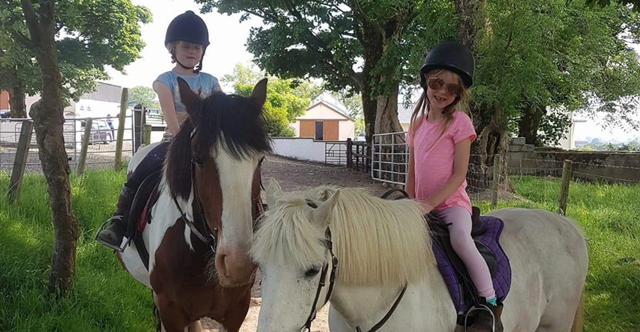 Riders enjoy the challenge of learning the basics of trotting which is lots of fun and very carefully supervised. This is very popular and is always seen as a personal achievement for all visitors. 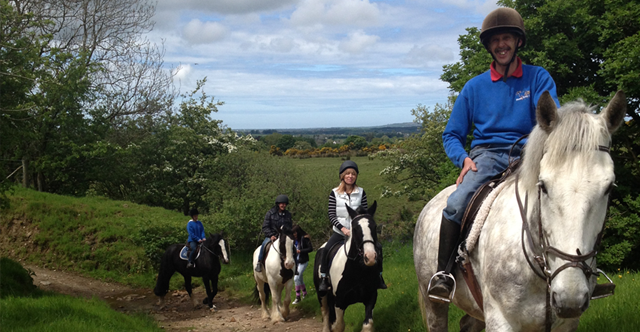 *A 15 stone (95kg) weight limit may apply to all riders depending on the availability of our larger horses. Trek through low lying pasture land, along tree lined lanes and keep an eye out for the badger sets along the way. Perfect trek for children or novice riders. Enjoy a trek taking you across gurgling streams and along tree lines lanes before heading onto the hill. Finish off with trotting in the arena. Suitable for all levels of horse riders. A fabulous trek following the Glasnafernan Burn through pasture before the land begins to rise to the highest point on the trek with stunning views over five counties. Finish off with trotting in the arena. Suitable for all levels of horse riders.